Welcome to our comprehensive list of available options, services and accessories. Use it to ponder the many possibilities or as a tutorial on the wonderful attributes of Integrity™ Aluminum fences. Either way, remember that our friendly, professional and informed associates are always just a toll-free phone call away, ready to assist you in the selection of your perfect fence! Please note that frequently, our fence styles already feature some of the options listed below. When they do, their price reflects the inclusion. When they don't, and an option or accessory is added, there is an upcharge unless otherwise stated. There are 18 standard styles of Integrity™ fences. Unless otherwise specified, all gates ordered will correspond with the style of fence ordered but gates can be purchased independent of panels. All styles can be ordered in any grade collection. For instance, if you like the Sanibel™ style (shown at left), you can buy the Sanibel™ style in any grade we offer, residential or commercial! 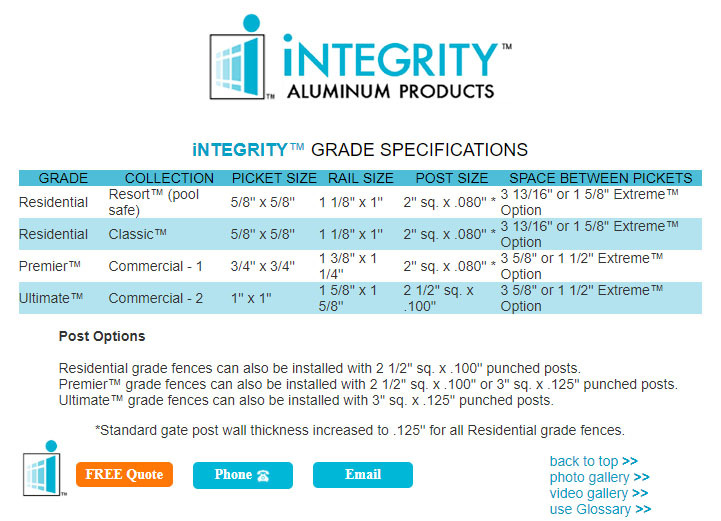 There are four grades of Integrity™ Aluminum fences organized into Collections. Each grade has different architectural specifications. For instance, the vertical pickets become larger in each successive upgrade. Architectural drawings of Integrity™ fence products are available for download, making it convenient for architects and contractors to attach fence schematics to their plans. Homeowners too, often need to submit technical drawings of their proposed fence for local government or homeowners association approval. We make it easy! Since the world is not flat, it is often necessary to install fence panels on a sloped terrain. Standard fence panels can ''rack'' or conform to a grade slope, but there are limits (which are noted in the SPECS tab of each fence style). There is no upcharge for Xtra-Rack™ or Max-Rack™ panels for residential and commercial grade fences. learn more! For more severe grade slopes, Xtra-Rack™ rackable panels can be ordered. See style specifications for the limits of Xtra-Rack™ panels. If your conditions exceed these limits as well, we offer a Max-Rack™ feature on many styles, but we recommend you consult with one of our sales associates for the limits of our Max-Rack™ rackable panels. Panels come factory-assembled as Xtra-Rack™ or Max-Rack™. These features must be specified at time of purchase and cannot be added to previously built panels. Double the number of pickets and tighten the space between them to convert any style into an iFence™ "Extreme". The Extreme™ feature makes it safer for small animals and adds a measure of privacy. The tighter picket spacing is not extended up beyond the middle horizontal rail in any three-rail design. Panels come factory-assembled as "Extreme". This optional feature cannot be later added. learn more! Non-conforming conditions are common to fencing, so while others offer only 6' wide panels in pre-determined heights, we offer you real solutions for real circumstances. Let us eliminate your frustrations with cost-effective customization! learn more! For instance, do you need to fence in an area one foot longer than a multiple of 6'? Save yourself the cost of an extra post and the work involved in digging another hole by ordering one 7' wide panel. Conversely, when fencing in an area one foot less than a multiple of 6', save money by ordering one 5' wide panel and eliminate the waste! Often, just one panel needs to be taller than the rest. Or shorter. Maybe you need a gate that's made for a 50'' opening instead of a standard 48'' opening. Don't sweat it. And don't let a lesser outfit force you into ''standards'' that don't work for your special conditions. Save time and money with No-problem™ customization! On ImPress Point™ spear top designs, the Nouveau™ picket option eliminates ImPress Point™ peaks. Instead, pickets are simply cut and capped with vinyl cap inserts. The Nouveau™ option must be specified at time of order. Panels come factory-assembled with "Nouveau™ pickets" but the vinyl cap inserts can be purchased separately if needed. Any spear top fence featuring finial peaks can be ordered with staggered-height pickets, just like the Bella Terra™ style, which comes with pressed point pickets in a staggered configuration. This option can be chosen for any grade or collection. Fence panels come factory-assembled with the staggered-height feature but this option must be specified at time of order. Gates can be ordered single-leaf or double-leaf, standard (straight) or arched, as depicted. These drawings are only a representation — your gate design will reflect your selected style and can be ordered independent of any fence panels. learn more! Complete architectural details are provided when a specific style of fence is chosen. After you select a style, there are four configurations available. Gates can be ordered single-leaf or double-leaf, standard or arched, as depicted. These drawings are only a representation - your actual gate design will reflect your selected style. For great advice on ordering a gate we offer the below informative tutorials. This top-selling latch by D&D Technologies® features tough, glass-reinforced polymer construction and is key-lockable (safety key, not re-keyable). It's engineered for ease of installation. This versatile latch will work on both left and right swinging gates and comes with a limited lifetime warranty. An optional "External Access Kit" allows the main latch to be operated from outside the fence. Same as the above top-selling Lokk-Latch® gate latch by D&D Technologies® except with an ''External Access Kit'' included to allow the main latch to be operated from outside the fence. The top-of-the-line Lokk-Latch® PRO-SL offers all the popular features of our basic model, with the added security of a 'self-locking' function. learn more! As the latch closes it automatically locks and a key is required to enter and exit, providing an extra dimension of security and making Lokk-Latch® PRO-SL the ideal choice for installation in apartments, condos, commercial and other security-conscious properties. Its sturdy 6-pin security lock can be re-keyed by a locksmith to match most household doors for convenience, while its robust construction and hi-tech engineering ensure Lokk-Latch® PRO-SL will last a lifetime. The Z-LOKK® magnetic gate lock is a magnetically triggered security lock engineered for quick and easy installation on iFence aluminum picket gates. Its stylish, modern design is aesthetically pleasing and cost-effective. learn more! By eliminating the need for welding or milling, the Z-LOKK® magnetic gate lock also significantly reduces the time required for installation. No special tools are required for installation, making it a simple job for home handy persons and professional installers alike. Z-LOKK® magnetic gate lock's dual, 6-pin security locks can also be rekeyed (by a locksmith) to match other household door locks for a completely integrated security system. This state-of-the-art latch is self latching is the "hands free" way of closing your gate and greatly reduces the risk of leaving a gate open for kids or pets to slip out. One of the world's safest gate latches, ideal for swimming pool gates and other child safety enclosures. learn more! Magna-Latch's® magnetically triggered action means there's no mechanical resistance to closure. Problems with gate latches jamming or sticking, associated with traditional mechanical latches, are eliminated. It can be installed quickly and easily to gates of all materials, adjusts horizontally and vertically, during and after installation. Series 2 is 20% stronger than previous models and has been tested to 400,000 cycles. It will last the test of time. This upgrade is available for each of our Collections and can be ordered separately at any time. (Note: All Resort Collection™ pool fences are automatically upgraded and always include a Magna-Latch®!) Available in black color only. The Vertical Pull Magna-Latch® model, also known as the Pet Latch, uses the same revolutionary technology as the standard design in a smaller, more compact body. It is suitable for mounting on taller pool gates where it will still be out of reach of children, as well as on garden or household gates to provide a safety barrier for pets. learn more! Like the standard model, the Vertical Pull model offers easy adjustment, is key-lockable for added security and won't disengage from shaking or pulling. Must be specified at time of order as ''Vertical Pull'' or the standard Magna-Latch® will be automatically shipped. These state-of-the-art self-closing hinges are the "hands free'' way of closing your gate and greatly reduce the risk of leaving a gate open for kids or pets to slip out. Injection-molded from special glass-fiber reinforced engineering polymers, providing strong, rust-free hinges that won't bind, sag or stain, and require no lubrication. learn more! The unique, spring-loaded adjuster within Tru-Close® hinges allows quick, incremental tension adjustment using only a screwdriver. This upgrade is available for each of our Collections and can be ordered separately at any time. (Note: All Resort Collection™ pool fences are automatically upgraded and always include Tru-Close® hinges!) Available in black color only. These plain and reliable hinges are an ideal cost-effective option where a self-closing feature is not required. Included as standard hardware for our residential Classic™ and our Commercial Premier™ grade gates. Suitable for gates up to 45lb. Can be ordered à la carte in each grade. Black. For a more durable hinge system for smaller gates that do not need to comply with pool safety codes, consider the J-Bolt metal hinge system. It is very effective for conditions necessitating the installation of a gate directly onto a structure without the use of a gate post. This is the most durable hinge system we offer! When ordering larger gates using 4'' square posts, order welded Titan™ hinges with nylon bushing. We recommend these hinges for all commercial grade Premier™ and Ultimate™ double gates as well as all Estate gates. As always, when ordering a gate, specify the size of the opening and the type of hinges. We will then build the gate to fit! Installed at the base of the gate, a Gate Stop® has a rubberized tip that softly brings the lower part of the gate frame into contact with the gate post, helping to stabilize the gate and protect it from being pushed inward beyond the latch point. All Resort Collection™ single gates include this smart feature as "standard equipment". Does not come factory-installed. While best to avoid installing gates on a sloped area, sometimes there is no choice in the matter. When this happens, take advantage of our Custom Fence Services and have your gate built to conform to the slope and welded to stay that way! learn more! Of course, you'll need to be responsible for taking accurate measurements and telling us which way the leafs swing but after that, just relax and receive just the gate you need for your non-conforming condition! Our gates are built to last with durable welded 2'' uprights on all residential and Premier™ grades and welded 2 1/2'' on our Ultimate™ grade gates. For wider gate openings such as 6' single-leaf residential or an 8' or greater single-leaf Premier™ or Ultimate™ grade gate, you may want to consider a U-Frame. learn more! "U-frame" means that the material used for the uprights on each side of the leaf are connected at the base with like material, welded into place at the base and form a "U". This is the clean way to beef up a gate, without the use of diagonal bracing, which is sometimes discouraged by code. While some companies surprise you with the need to buy essential hardware separately, all iFence™ double gates come with one drop rod included. These basic drop rods come in black only and can be purchased separately when needed as a replacement or for the occasional use on a single gate. When you need a drop rod to lock, look no further than this gem of a drop rod. Featuring a rugged stainless steel and reinforced fiberglass construction this latch is not only functional and looks good, but can also be keyed alike to most house doors. Kwik-set key way. Available in black color only, can be purchased as an upgrade to an order of any double gate, or separately at any time. Any of our gates, single or double, in any of our collections, residential or commercial, can be upgraded to an arched gate. This cost-effective upgrade will highlight your gate passage as a beautiful focal point. Arched double gates are constructed as two halves of one continuous arch. learn more! We offer three very attractive Arch designs: Sunrise™, Sunset™ and the Wave™ Arch. Often, when the optional arched feature is selected, ball caps for the gate posts are also selected. Our Driveway Gates are in a class of their own. When your entry gate must make a statement, our maintenance-free aluminum gates are the perfect choice. Let our design consultants assist you in selecting just the right gate for your private estate or gated community entrance. learn more! Driveway gates are available in every style of fence and color we offer and can also be customized to your taste. Durable, welded, powder coated and braced to accept automatic gate operators, our Driveway Gate Collection is the NO-rust alternative to wrought iron or metal gates of days gone by. Now you can say good bye to rusty gates! Activate our iDesign™ Gate Studio and start designing your gate right away! It's very easy and lot's of fun! Integrity™ Aluminum fence posts are available in five standard types. All types of posts are available in various lengths. Don't worry, we will help you determine what types and how many you will need should you place an order. You do not need to have an exact list to get a preliminary quote on your project! learn more! Please note the following exceptions: Commercial Ultimate™ grade panels cannot be installed using 2'' square posts, and 3'' square posts cannot be punched for the installation of any Residential or Designer grade panel. Additionally, all 4'' square posts (or larger) are only available as blank posts and cannot be punched for any grade. Any type of 2'' square post is available in three wall thicknesses: .060'', .080'', and .125''. Any type of 2 1/2'' square post is available only in .100'' wall thickness. Any type of 3'' square post is available only in .125'' wall thickness. Each Collection of Integrity™ fences has its own default specifications for wall thicknesses and lengths (which vary based on height of fence selected). These default specifications are listed within the detailed specifications of any style of fence we offer. A type of post that ends a line of fence is an end post. An end post has punched holes only on one side for fence panel rails to slide into. Only one panel of fence is connected to an end post unless rail mounting brackets are used to attach panels to the sides of the post without punched holes. learn more! A gate usually terminates a line and is therefore typically installed using end posts. Calling these end posts "gate end posts" simply serves to indicate that in the residential and designer grades their wall thickness is beefed up to .125'' (instead of our standard .080'' thickness for all posts other than gate posts). If the fence continues on the other side of a gate, that post would also be an end post. All posts can be ordered in any standard Integrity™ color. Each grade of fence has its own post size specifications, which are detailed in the grade specifications chart. When ordering end posts without corresponding fence panels, it is necessary to specify the exact fence style for which they are intended, or the fence panels may be incompatible with "punched" holes of your posts. A line post is a type of post that has punched holes on two sides, opposite each other and used to attach two fence panels to form a straight line. Line posts can be used to form a curved fence line when the attached panels are slightly angled to alter the direction of the fence line. Repeating this at each line post is the technique for installing a fence in a curved configuration. learn more! An easy way to figure the quantity of line posts required on a line of fence is to figure the total panels in the line and then subtract one. That is why it is necessary to know measurements of each line of fence including the measurements on both sides of a gate. The gate breaks a fence line into two distinctly different lines for which accurate measurements are needed. Line posts can be ordered in any standard Integrity™ color. Each grade of fence has its own post size specifications, which are detailed in the grade specifications chart. When ordering line posts without corresponding fence panels, it is necessary to specify the exact fence style for which they are intended so the "punched" holes of your posts are compatible with the fence panels to which they will be attached. A corner post is a post that is used on a 90 degree corner to join two lines of fence. The holes are on two sides adjacent to each other. Corner posts can also be used for odd angles where the angle is between 45 and 90 degrees. An angle of 45 degrees may require an adjustable mounting bracket, depending on style and preference. learn more! Corner posts can be ordered in any standard Integrity™ color. Each grade of fence has its own post size specifications, which are detailed in the grade specifications chart. When ordering corner posts without corresponding fence panels, it is necessary to specify the exact fence style for which they are intended, or the fence panels may be incompatible with "punched" holes of your posts. A blank post is a post with no holes. The most common use for a blank post is as a gate post where no fence panel is to be attached to the post. Therefore a gate post can be a blank post and when it is, its wall thickness will be .125'' in the residential and designer grades. learn more! If at all possible we recommend that you avoid using blank posts as hinge posts. A gate is better secured when a fence panel is attached to the gate post. Blank posts can be ordered in any standard Integrity™ color. A three-way post is essentially a three-way corner post used on a 90 degree corner to join three lines of fence. The "punched" holes are on three sides of the post; the fourth side is blank. Often, a three-way post is used when two neighbors share a fence line. learn more! Three-way posts can be ordered in any standard Integrity™ color. Each grade of fence has its own post size specifications, which are detailed in the grade specifications chart. When ordering three-way posts without corresponding fence panels, it is necessary to specify the exact fence style for which they are intended so the "punched" holes of your posts are compatible with the fence panels to which they will be attached. When you want to beef up the posts for an intermediate size gate, consider 4''x4'' aluminum posts. These strong posts are a necessity when your gate is being hinged with Titan™ hinges, which require a 4'' surface for proper mounting. Available only as blank posts in a variety of lengths, mounting brackets are needed if panels are being attached. Order in any one of our standard Integrity™ colors. For swing gates with leafs 12' wide or wider and cantilever gates for openings wider than 16', we recommend steel posts for structural integrity. These durable 4''x4'' posts are available in a variety of lengths and in all standard Integrity™ colors, but must be ordered as blank posts. learn more! When attaching fence panels to these posts, mounting brackets are a necessity. On rare occasions, customers request even larger 6''x6'' steel posts. This larger size must be special ordered and often cannot be shipped within typical lead times. This is a decorative way to cap any size post. Ball Caps can be purchased for all posts on an order or just some of them. They are available in our standard Integrity™ colors, or in gold. learn more! When a standard cap is upgraded to a ball cap the post comes with just the ball cap, not both caps. Ball caps are not factory installed and can be purchased separately at any time, even to add on existing Integrity Aluminum Products™ fences. All posts for our Resort™ and Classic Collections™ feature 2'' square with two grades of wall thickness (.080'' and .125''). These posts can be upgraded to 2 1/2'' square (available only in .100'' wall thickness). These posts, like all others, include standard caps unless they are upgraded to ball caps. learn more! While not a structural necessity, upgrading to 2 1/2'' square posts can be for the entire project, or if you like, just for the the gates, but this option must be specified at the time of order. All posts for our Premier™ or Ultimate Collection™ come 2 1/2'' square with a wall thickness of .100''. These posts can be upgraded to 3'' square (available only in .125'' wall thickness). These posts, like all others, include standard caps unless they are upgraded to ball caps. learn more! 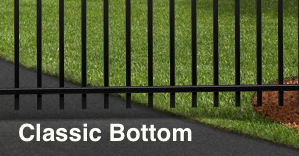 While posts are ''punched'' to create size and shape-specific holes which accept the horizontal railing of the fence panels, it is sometimes advantageous to make these holes larger (top-to-bottom only), so that the horizontal rails can have more room to maneuver when fence is being installed on a sloped grade, or when conditions necessitate this method of installation. learn more! One example is where all posts are installed in advance rather than the typical ''post and panel'' installation method. When ordering posts punched according this option, you will need to specify potential changes in the horizontal rails of corresponding fence panels as well, such as the elimination of notches. Charges during the day and shines at night, this aluminum lamp fits nicely onto any 2'' square post. Order for gate posts, corner posts, every other post, or all posts! Available in black color only. Many styles come adorned with circles positioned between pickets and between the top two horizontal rails of a three-rail fence design. Circles can be added to some styles that don't ordinarily come with them. learn more! Circles can be added to styles such as Bella Vista™ or Bella Terra™. Panels come factory-assembled with circles, which slightly alters the spacing of the top two horizontal rails. This optional feature cannot be added to previously built panels. Available in all standard Integrity™ colors and also in gold. Many styles come adorned with Butterfly scrolls positioned on the vertical pickets between the top two horizontal rails of a three-rail fence design. Butterfly Scrols can be added to some styles that don't ordinarily come with them. learn more! Butterfly scrolls can be added to styles such as Bella Vista™ or Bella Terra™. Panels come factory-assembled with Butterfly scrolls but this optional feature can be added to previously built panels. Butterfly scrolls can be ordered "Lite," meaning they are placed on every other picket on an alternating basis. Take a look at our Amarillo™ style, which comes this way by default to see if you like the "Lite" look! Butterfly scrolls can also be purchased separately, as needed. Available in all standard Integrity™ colors and also in gold. Many spear top fence styles come adorned with factory-installed Fleur de Lis finials at the peaks of the vertical pickets. learn more! Available to fit Classic (5/8'' square), Resort (5/8'' square), Premier (3/4'' square), Ultimate (1'' square) Collection vertical pickets as well as John Russell™ (5/8" x 1 5/8'') vertical pickets can also be purchased separately when replacements are needed. Available in all standard Integrity™ colors and also in gold. Many spear top fence styles come adorned with factory-installed Excelsior™ finials at the peaks of the vertical pickets. learn more! In addition to our standard colors, the following accessories are also available in gold: circles, butterfly scrolls, estate scrolls, Excelsior™ finials, Fleur de Lis finials, and ball caps. Each of the above options is available in all grades with the size of the rail, the size of the punch, and the spacing between punches determined by the chosen grade. learn more! SmartRail™ can also be purchased for any Concealed Fastener System (CFS) such as Don Phillips™ fence panels or Encore!™ hand railing. Additionally, SmartRail™ is available in any of our standard Integrity™ colors and comes with rail ends factory-notched unless otherwise indicated. Note: When ordered punched Extreme™, SmartRail™ can be punched Xtra-Rack™ but not MaxRack™. Also called a ''rail end notcher'', this tool is used to "notch" the ends of the horizontal rails of an Integrity™ fence, allowing them to slide into the narrower punched holes of a post. Since horizontal rails come factory-notched, this tool has limited use for do-it-yourself installation and is most often used by high volume contractors who cut and ''re-notch'' horizontal railing on-the-job. learn more! Comes standard for residential grade notching, commercial grade conversion kits are sold separately. Each of our fences are constructed using one of four sizes of vertical pickets. Vertical pickets for flat top and spear top fences can be purchased separately in any size and color in one foot length increments ranging from 1' to 8'. We are happy to quote customized lengths. On pressed point spear top designs, the Nouveau™ picket option eliminates pressed point peaks. Instead, pickets are simply cut and capped with vinyl cap inserts. These Nouveau™ vinyl cap inserts can be purchased separately if needed. Available in residential or commercial, simply specify the desired size when ordering. Black color only. You may find it necessary to buy extra screws for your project. We carry two sizes of screws: 5/8'' #8 self-drilling (to attach vertical pickets to horizontal rails) or 1'' self-drilling (to attach horizontal rails to posts or to mounting attachments). Screws are sold in boxes of 100 in each of our standard colors. When safety codes become an issue, the Encore!™ Collection of hand railing complements Integrity™ fences while meeting or exceeding most standardized building safety codes*. The top and bottom horizontal rails are totally enclosed to provide incredible strength. This concealed fastener system (CFS) hides all fasteners for a beautifully sleek look for your deck, balcony, patio or porch. learn more! Innovative, stylish and durable, Encore!™ is available in heights of 36'' and 42'', with four attractive top rail profile options in widths of 4', 5', 6', 7' and 8'. All standard Integrity™ colors are available. Visit our Encore!™ link for more information. Walk gates for Encore!™ Hand Railing are available in any top rail profile in opening widths of 3', 3 1/2', or 4'. Arched feature not available. Gate hinges and latches sold separately. All standard Integrity™ colors are available. Any of the four Encore!™ hand railing top rail design profiles can be purchased separately by-the-foot in one-foot increments up to 10' long. This top rail is designed as a concealed fastener system (CFS), with the outer profile snapped together with an inverted Premier™ grade horizontal SmartRail™. learn more! Sold together as a unit here, either component can be quoted separately upon request. Available in any of our standard colors. Visit our Encore!™ link for more information. The lower rail of any Integrity™ Encore!™ hand railing panel is actually Premier™ grade SuperRail™ Concealed Fastener System (CFS) and can be ordered separately by-the-foot. Any of the four Encore!™ hand railing top rail design profiles can be purchased as a grab rail system, sold by-the-foot in one-foot increments up to 10' long. Encore!™ Grab Rail is an independent rail – not a panel – and is intended for wall mounting using special wall mounting brackets (see below). All standard Integrity™ colors are available. Designed to wrap around existing posts, these decorative aluminum columns snap together to cover unsightly concrete or weathered wooden posts. Give your porch a face-lift with this attractive Encore™ innovation. Available in 6'' or 8'' square sizes in 8', 10' or 12' lengths. Can be trimmed shorter when installing, available in all standard Integrity™ colors. Caps and skirts sold separately. Dress up decorative aluminum columns with base skirts for a finished, professional look. Sold separately to fit either 6'' or 8'' column sizes. Available in all standard Integrity™ colors. Top off decorative aluminum columns with these attractive caps for a finished, professional look. Sold separately to fit either 6'' or 8'' column sizes. Available in all standard Integrity™ colors. The internal corners of these unique posts are designed to accept screws for the attachment of a Boss Screw Post Flange (see below). Though specifically designed for use with our Encore!™ Hand Railing Collection, Boss Screw Posts can be punched to accept the horizontal rail of all Premier™ grade fence panels. learn more! When ordered as blank posts and used in conjunction with mounting brackets, any grade of fence can be installed with Boss Screw Posts. Available in 2 1/2" square x .100'' or 3'' square x .125'' in all standard Integrity™ colors. Hide the fasteners with these innovative flanges! Boss Screw Post Flanges are designed to be used only in conjunction with complementing Boss Screw Posts, which are engineered to accept screws for the attachment of this flange. Optional welding is available for a minimal upcharge. Available in all standard Integrity™ colors. Standard Encore!™ hand railing panels are constructed using 3/4'' square vertical pickets. These pickets can be upgraded to a 3/4'' Bravo!™ Baluster for any Encore!™ panel style. The Bravo!™ Baluster system is available for both 36'' and 42'' high panels in all standard Integrity™ colors. "Looks great! Thanks for everything! With Kind Regards,"